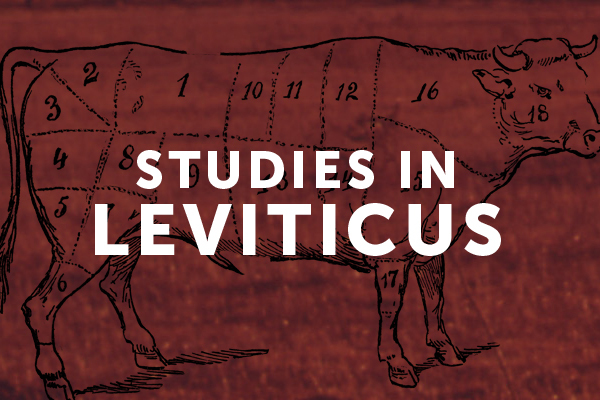 We’ve seen it again and again throughout our study of Leviticus, this is a bloody book. Chapter 17 in particular is focused around the concept of blood. In this section we find several prohibitions given to the people of Israel regarding blood. The spilling of blood is a serious matter because it has been designated as a symbolic representation of substitutionary sacrifice for God’s people. Chapter 17 is a bit of a transition point in the book as a whole. The first 16 chapters of Leviticus focus on corporate worship. The emphasis in these chapters is on the collective responsibility of the people of Israel before God. But chapters 18-27 shift our focus to the personal or individual responsibility of God’s people, what is sometimes called the “Holiness Code” section of the book. Chapter 17, then, is a transition point in the book. It is clearly related to what has transpired before hand, specifically chapter 16, but it is also connected to what lies ahead. The prohibitions in this chapter can be broken down into two sections: (1) laws about the place of sacrifice; (2) laws about eating blood. The first prohibition deals with corporate worship, the second emphasizes individual responsibility. In both cases the point is to highlight the significance of Israel’s obedience to God. The first prohibition stresses that sacrifices are to be exclusively offered at the Tent of Meeting. The text tells us that Israel was frequently tempted to offer sacrifices to false gods. So, in verse 7 we are told that the Israelites had made sacrifices to “goat demons, after whom they whore.” God establishes, then, in this first prohibition, that sacrifices are only to be offered at this prescribed place. They are not to take place in the open field (v. 5), and any sacrifice of ox, lamb, or goat is to be made by the priests (v. 5). Allen Ross states that this is to “safeguard the use of blood for true worship” (Holiness to the Lord, 334). The penalty for violating this law was to be “cut off” from the people of God. The idea behind the punishment is that of a death sentence executed by God himself. Since the sin was a “secret sin,” so to speak, and the people may not know, God was the one who would have to execute judgment. And He would. 20 “When the Lord your God enlarges your territory, as he has promised you, and you say, ‘I will eat meat,’ because you crave meat, you may eat meat whenever you desire. 21 If the place that the Lord your God will choose to put his name there is too far from you, then you may kill any of your herd or your flock, which the Lord has given you, as I have commanded you, and you may eat within your towns whenever you desire. 22 Just as the gazelle or the deer is eaten, so you may eat of it. The unclean and the clean alike may eat of it.23 Only be sure that you do not eat the blood, for the blood is the life, and you shall not eat the life with the flesh. 24 You shall not eat it; you shall pour it out on the earth like water. 25 You shall not eat it, that all may go well with you and with your children after you, when you do what is right in the sight of the Lord. So, the law changed as God’s people grew and they changed. God’s law is always sensitive to the conditions of His people, so as their conditions changed He accommodated their needs. The principle of the law does not change, but the application of it varied. The sanctity of blood is still stressed in the passage, but the rules about the geography of slaughter have changed. For the life of the flesh is in the blood, and I have given it for you on the altar to make atonement for your souls, for it is the blood that makes atonement by the life. Blood has a purpose in sacrifice. To use it any other way is to dismiss its significance in making atonement for sinners. Now this did not mean that the people could never hunt. God allows them to do that, but has guidelines even for this. So, in verses 13-16 he applies this prohibition to the realm of hunting, stating that a hunter must pour out the blood from his slain prey, he is not to consume it either, and if he comes upon an animal that has died in the wild it is to be avoided. Eating such an animal requires that a person follow proper ritual to be declared once again clean. The major point of the section is the emphasis on the ritual sanctity of blood. In the Old Testament this meant certain specific prohibitions, not the least of which was an emphasis on refusing to consume blood. In the New Testament, however, we see the sanctity of blood applied directly to the death of Jesus Christ. His blood is sacred, not because it is blood mind you, but because it is the symbol of atonement. Interestingly enough, however, in the New Testament consumption of the blood of Christ is exactly what we are told to do (Matt. 26:27; 1 Cor. 11:25). We are instructed to drink the blood of Jesus (John 6:53-54). The language is intended to be figurative, but that should not undermine its significance. The shedding of the blood of bulls and goats did not ultimately take away sin (Heb. 10:4), but the blood of Jesus fully and finally deals with sin. The believer, then, must accept and appropriate the sacrifice of Christ for his life and faith. We need the blood of Christ and we are reminded of it every time we participate in the Lord’s Supper. Throughout history there have been those who have attempted to deny, diminish, or reject the bloody death of Christ, yet still insist that they are Christians. They speak of a non-violent atonement, of a bloodless salvation, but their theology is false. The Bible insists on the sanctity of blood and the importance of shedding blood for atonement (Heb. 9:22). The bloody death of Jesus may make us uncomfortable, but it is essential for salvation. The blood matters, and we as Christians ought to regularly celebrate and remember the shed blood of Christ.